PIA provides a wide array of study support services, including academic tutoring, conversation partners, TOEIC test preparation, and student success workshops. Students can sign up for a free 30-minute appointment in the Tutoring Center each week. Tutors are PIA faculty members, and they can help students with their academic goals, such as homework questions, the TOEFL, or cultural questions. Free tutoring takes place after classes in the library. Additional unlimited tutoring is also available for a fee. Click here to sign up for an appointment at the Tutoring Center! 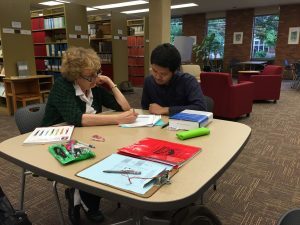 Another function of the Tutoring Center is helping students improve their study skills. Two times each term, PIA offers Student Success Skills Workshops that help students achieve their educational goals in the US. Students learn about time management, how to stay organized, exam preparation, planning long-term projects, and effective group work. These free programs give students a chance to meet with native speakers for informal conversation. This allows students to share information about their culture, practice English, and make friends with Americans! Conversation partners meet in one-on-one situations and talk about whatever interests them. The weekly conversation forum is open to all students and community members. In the forum, topics are provided, such as culture shock, dining out, and gender roles.